Visit the inside of the barn where you’ll find our delicious homemade cider, bags of fresh apples, decorations for your home, New York Maple syrup and honey. 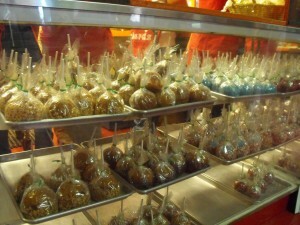 Our Candy Room is where you will find our caramel popcorn balls, freshly popped popcorn, and hand dipped candy apples with a hard candy shell, caramel, cinnamon, or turtle apple. The Donut Room is where you can go for a slice of homemade apple pie, delicious donuts, hot cider, or a steaming cup of coffee. In the Fudge Room you’ll find more goodies for your sweet tooth with various fudges and cotton candy. We have wine tasting from Ashley Lynn Winery available as well for 21 and older, note that we do I.D. Come visit our Apple Cook Shack where you’ll find deep fried Apple Fritter Rings, Fried Dough, or Funnel Cake along with Hoffman Hot Dogs and Coney’s, French Fries, Hamburgers, Chicken Tenders, Homemade Chili, Mozzarella Sticks, or Nachos and Cheese. Our Play Land is located behind the Apple Cook Shack where you can find fun for all ages. 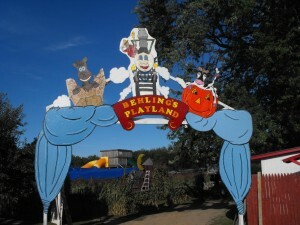 For the kiddies we have a Corn Maze with slides and around back are inflatables such as Moon Bouncers and Slides. Children can pet and ride real horses at the Pony Rides. Enjoy our Zombie Paint Ball where you can take down the zombies before they take over the orchard. All of these activities will take tickets from our Ticket Booth which is located to the left of our Apple Cook Shack. For all ages we have live animals to learn about, feed, and interact with. There will be Wagon Rides out into the Apple Orchard which will bring you right to your favorite variety of apples to pick.